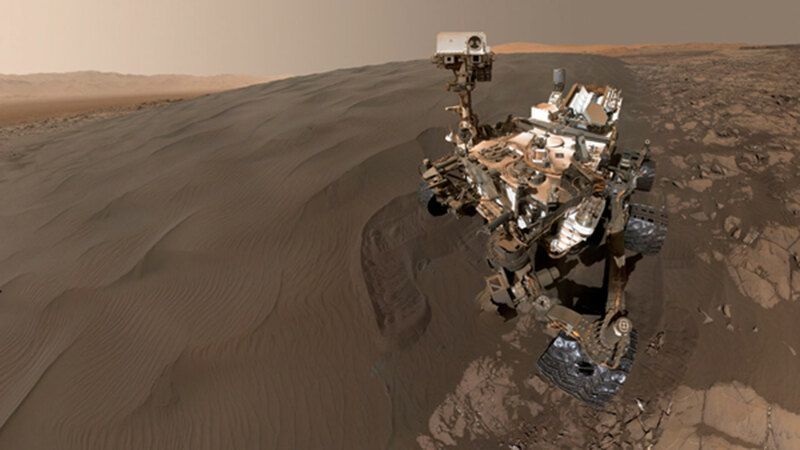 HOUSTON -- Even NASA's Curiosity Mars rover is into selfies. The space agency released a photo combining 57 images taken on Jan. 19 at Namib Dune, where the rover is scooping sand for lab analysis. The photo was taken by the Mars Hand Lens Imager (MAHLI) at the end of the rover's robotic arm. "The view does not include the rover's arm. Wrist motions and turret rotations on the arm allowed MAHLI to acquire the mosaic's component images. The arm was positioned out of the shot in the images, or portions of images, that were used in this mosaic," NASA explained in a statement. NASA says the Namib Dune is part of the dark-sand "Bagnold Dune Field" along the northwestern flank of Mount Sharp. Scientists believe these dunes move as much as about 3 feet per Earth year.